SNAG® Golf is all about having FUN while learning the basics of golf. SNAG® is a tested player development program designed for new learners of all ages. 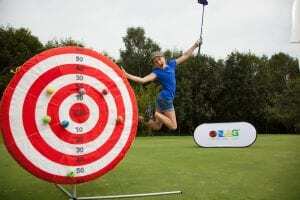 SNAG® contains all the elements of golf but in a modified form, making it an easy and fun way to learn and play golf. The system builds on strong fundamentals of putting, chipping, pitching and full swing to develop playing ability quickly and effectively. SNAG® incorporates developmentally appropriate equipment and instruction that will allow golf to be learned and played in non-traditional venues, such as on a soccer field, in a gym, or on the beach. The game has its own simplified rules and terminology that adds fun to the learning and playing experience. 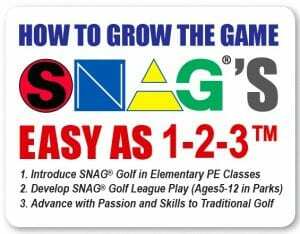 Whether you are a beginner, advanced golfer, sport enthusiast, child, active adult, family or group, teaching professional or parent, SNAG provides equipment, games and programming to increase the skill set of the learner and the level of fun associated with movement and socialization. An experience of its own, SNAG is the near perfect pairing of challenge and initial success in the world of golf. SNAG for Children. SNAG is the perfect modified system for children to effectively learn how to play golf. A playful approach based on fun, SNAG’s teaching components expedite the learning process and create a positive, yet challenging, atmosphere while developing motor skills and fundamentals. SNAG for Adults. While an excellent resource for beginners, SNAG is also just as effective for the avid golfer who just can’t get enough of the game. Training aids and portability allow players to bring the game to their backyard, and challenge friends during the backyard barbecue. Whether you are 5 years or 95 years young, SNAG can go wherever you go! Oh the places SNAG will go! SNAG in Schools. With lesson plans and games based on national physical education standards, SNAG’s Scholastic Curriculum offers a way for schools to broaden their physical education with the integration of golf. This opportunity doesn’t only make physical education more attractive, but also supports the introduction of the sport to minorities who may not learn the game, otherwise. For physical educators with no background in golf, be not afraid! SNAG’s simplistic breakdown makes it not only easy to learn, but easy to teach also. Training can also assist teachers in PE and academic integration options to take the sport into the classroom. Parks, Camps, Health, Fitness & Rehabilitation Facilities. SNAG trains balance, coordination, visual perception and eye hand coordination making it ideally suited for lifetime health and fitness promotion. Assisted living facilities, rehabilitation facilities and special needs programs can benefit from the modified form of golf that SNAG provides. Camps, parks and recreation departments can also benefit from SNAG’s versatility and portability by bringing recreational golf to community leagues for all ages. Much like T-ball for baseball, G-ball is recreational golf leagues for children 5 years and up. Find out how you can advocate for getting #snaggolf in your community! Golf Courses and Clubs. A great way to make members, with families, really happy is to have a great junior program or camp. With SNAG it has never been easier or more fun to teach numerous children the fundamentals of the game in a safe and exciting environment. Plus, having a women’s program is an awesome way to get the entire family golfing together! Businesses and Corporate Events. If you need a large corporate event, fundraising event, or a team building retreat for employees, SNAG can create an individualized event to meet your exact needs. You will definitely want to check out the SNAG Inflatable Driving Ranges, if you want to bring a lot of attention your way!